Everyone wants bigger arms, but there's no such thing as a magical workout you can do to get them. Here are the most crucial concepts you need to understand when it comes to building bigger biceps! If there's one constant in biceps training, it's that you have to do a basic curling motion—a movement in which your elbow flexes against resistance—to add strength and muscle size, but that's really just the beginning. 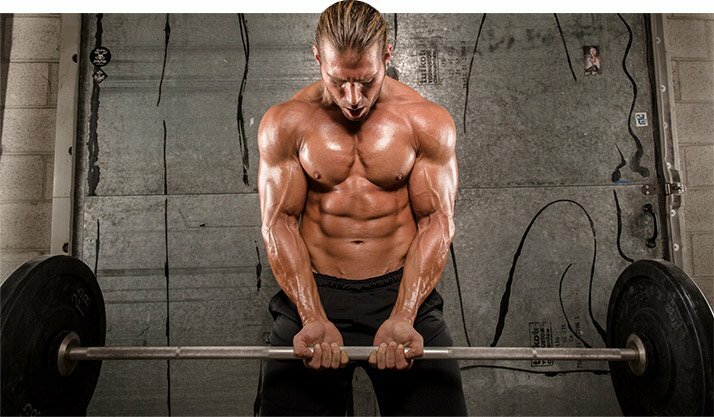 If standard curls were all you needed to build bigger arms, you'd probably have huge guns by now, and this would be a very short article! Alas, as anyone who's tried will tell you, building bigger biceps takes more than set after set of standard barbell curls. If you've stalled on your own quest for sleeve-splitting arms, follow the 10 laws of biceps training to get back on track! While biceps training may seem fairly straightforward because the body part only has two heads, it's actually a bit more complex than you'd think. For one, the brachialis—another upper-arm muscle that flexes the elbow joint—lies underneath the biceps. Even though the brachialis is a fairly small muscle, increasing its size can increase the overall size of your arm. The largest muscle of your forearm, the brachioradialis, which sits atop your forearm near your elbow and crosses the elbow joint, is also involved in some elbow-flexion movements. Knowing these additional muscles exist and accounting for them during your training will produce the greatest overall size and strength gains. For the best overall development, you can't just hammer your biceps and ignore everything else. You need to include hammer curls and forearm exercises, which I'll address later. Even though the muscles of your back are the prime movers on back day, your biceps help move the weight as well. That's why so many lifters train both muscle groups on the same day, sometimes called a "pull day" workout. You can arrange your split so that you train biceps after back on the same day (never before back—always train the larger muscle group first), but don't do a biceps day immediately after back day since your biceps would already be fatigued. There's any number of ways to split these body parts at least two days from each other, but keep your back in mind when devising your training split. What's the best exercise to start your workout with? The answer to that doesn't generally change: Do the movement in which you can move the most weight. Since there are essentially no multijoint exercises for the biceps—the chin-up is probably closest, which works the lats and biceps, but it's not considered a strict biceps move—your choice is among a wide selection of single-joint exercises. When choosing exercises, it helps to think of a question like this: How much weight can you lift when doing one-arm concentration curls versus standing barbell curls? Most likely, the barbell curl came out on top—and yes, that's the one you should start with. Standing barbell or dumbbell curls should be your go-to first movement for biceps training. Standing barbell or dumbbell curls should be your go-to first movement for biceps training. Trainers have long argued that falling into a comfort zone is one of your biggest enemies in the gym. If you're doing barbell curls first in your routine, the last thing you want to do is get comfortable and choose the same weight you've been handling for 10 reps workout after workout. The beginning of your routine is the best time to challenge your strength! After warming up, do relatively heavy sets as low as 6 reps to really stimulate your arms. Your biceps grow larger only when you make demands on them above and beyond what they're accustomed to. So push yourself—especially on those first sets before fatigue starts to set in. A little biceps anatomy can help you emphasize (though never isolate) one of the two heads over the other. The long head (which makes up what's called the biceps peak) is located outside of the short head, so using a grip inside shoulder width on barbell curls emphasizes its development. On the other hand, using a grip that's well outside shoulder width shifts some of the focus to the short head. One approach I've used on barbell curls is to do 2 sets with a slightly closer grip and 2 more with a slightly wider grip, rather than 4 sets with the same shoulder-width grip. That allows you to shift the emphasis slightly on your different sets, which is still the first exercise in your arm workout. Using a grip inside shoulder width on barbell curls emphasizes the long head development. It's possible to target the long head or short head by choosing the appropriate curling movement. Simply keep in mind that a fully stretched muscle is capable of a stronger contraction. Curling movements where your arms are in front of your body, such as lying cable concentration curls, preacher curls, and high cable curls, keep the long head from being fully stretched, and will better target the short head. Curling movements such as incline dumbbell curls, concentration curls, and hammer curls, fully stretch the long head and target it more specifically. Nowhere is this distinction clearer than when comparing incline-bench dumbbell curls—in which your arms hang straight down behind the plane of your body—against preacher curls, where your arms are well in front of the plane of your body. 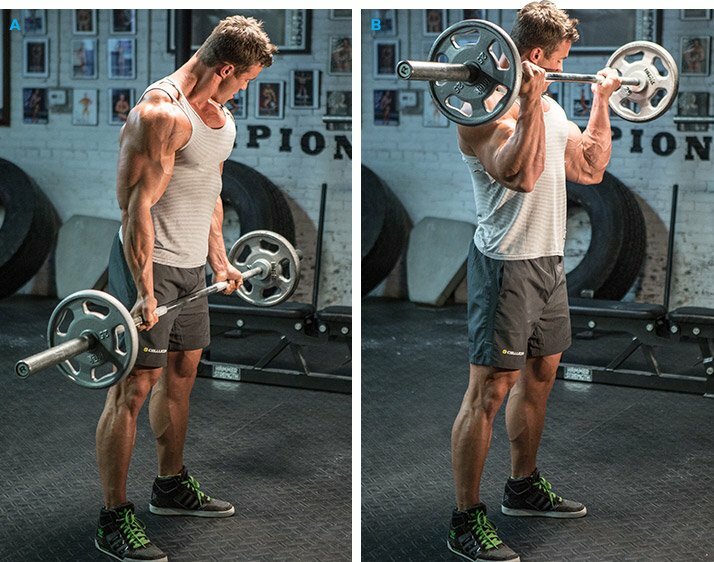 With the incline curls, the long head is fully stretched in the bottom position; with preacher curls, it's hardly stretched at all. Including exercises from different angles ensures you hit all areas of the biceps, and strategically choosing particular moves allows you to bring up a weakness or focus on a particular area for a period of time. 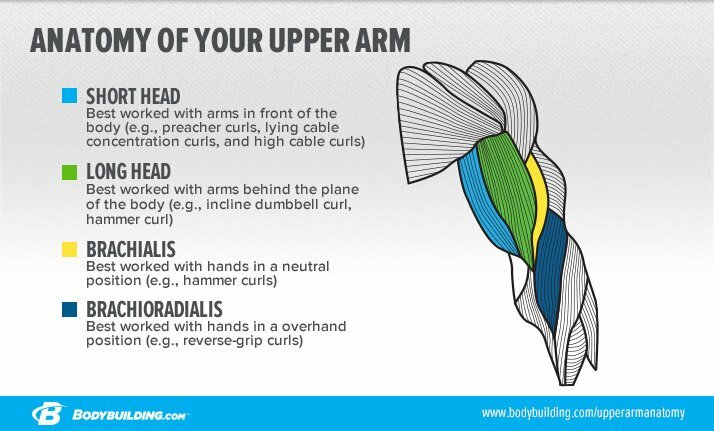 As you progress through your arm workout using different angles to focus on one or both of the biceps heads, consider adding movements that better isolate the muscle. Concentration and preacher curls, in which your arm is stabilized by pressing against your inner thigh or a bench, almost completely eliminate your ability to use momentum. As I mentioned earlier, these kinds of movements require you to reduce the amount of weight you can use, so they're best done toward the end of your biceps workout. As mentioned earlier, the brachialis muscle lies beneath the biceps brachii, but traditional underhand-grip movements do little to target it. Neutral-grip movements like hammer curls, however, are effective in isolating the brachialis, which can maximize the thickness of your upper arms.1 When you curl with your palms facing each other, you also target the biceps' long head and brachioradialis, making the hammer curl a good exercise to transition from the upper to lower arms. Finishing off your biceps workout with forearm exercises makes sense because your smaller forearm muscles assist on many of your biceps curls. As the smaller muscle group, they should typically be trained last. If you ever flip them and do forearms before biceps, you'll realize the limitations in just holding onto a bar! Reverse curls, in which you use an overhand grip, target the brachialis and brachioradialis, and wrist curls focus on the lower arms. Grasping a bar and flexing your wrists (wrist curls) works the wrist flexors on the underside of the forearm, while extending your wrists back (reverse wrist curls) target the extensors, which are the small muscles of the top of the forearm. As the smaller muscle group, forearms should typically be trained last. Single-joint movements make up the bulk of upper- and lower-arm training, but that doesn't mean individuals don't turn them into multijoint moves—accidentally or not—when they use a weight that's too heavy or don't know proper form. This is easily done when you allows your elbows to stray from your sides during exercise execution. Note that elbow flexion entails movement only at the joint, which means your arms should be locked by your sides throughout the set. What do you think happens when lifters pull their elbows forward as they curl? Enter the shoulders. Curling a weight and pulling your elbows from your sides to raise a weight higher is considered cheating, and it reduces the muscular tension on the biceps. To keep tension on the target muscle throughout your sets, keep your elbows locked by your sides throughout. You won't be able to raise the weight as high, but don't measure your success by distance—oftentimes that very top position is a rest spot, not a peak contraction, and you don't need to go beyond the toughest point. Wuebben, J., & Stoppani, J. (2009). Stronger Arms and Upper Body. Human Kinetics.